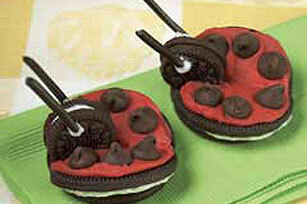 National Oreo Day – March 6th! Oreo Cookies where you can learn more about the many ways there are to eat a Oreo Cookie! Did you know that the Oreo has a SONG? You can download that by visiting Oreo Website and you can learn more about the “Wonderfilled” cookie known as Oreo there too! There are Oreo recipes and Oreo games… it’s a great site! And there are links to the Oreo Facebook page too! Did you know that according to the Mondelez Website, the Oreo cookie is marketed in the following countries: Argentina, Australia, Canada, China, Indonesia, Mexico, Netherlands, Peru, Poland, Puerto Rico, Romania, Russia, Spain, Taiwan, Thailand, Ukraine, United States, Venezuela, Philippines. The Oreo cookie and brand definitely have a life of their own – and Peerless Food Equipment is happy to celebrate National Oreo Day! What Does Patent #2,993,453 Have to do with Peerless? The patent referenced above, issued on July 25, 1961 is for Sandwiching Machines – is still the basic concept behind the Peters Sandwiching machines that we build today. Peerless has continued to refine and enhance the machine that Frank Peters’ company brought to fruition so many years ago. This year, a new patent application was published that will document a stencil assembly that is more readily adaptable to accommodate multiple row production. This latest published application is the work of one of our engineers at The Peerless Group – and we couldn’t be more proud. Peters Sandwiching machines are used all over the world. From China, to Brazil, from Chicago, IL to India. From El Salvador to Trinidad. Peters equipment is respected worldwide. As we continually work to gain more knowledge of the futuree – I ask everyone “What do YOU envision as the next “big thing” in Sandwich Cookies?” Leave your ideas in the comments.